You might think Adrian Ballinger is a really lucky guy, considering he's survived countless avalanches and earthquakes on his voyages up some of the highest mountains in the world. Be wary of taking too many risks. "When scaling a mountain peak, you'll find it's best to keep the risk taking to a minimum and take them only to avoid unexpected circumstances that might impact the ultimate success or safety of the climb," Ballinger says. He explains that at 20,000 feet, living on the edge and act haphazardly aren't an option. Risks are only taken after careful calculation and if an impasse presents itself to the team's original plan. This should be the same principle for business owners, Ballinger says. It's always best to stick with the original plan until it no longer works. "Don't let risk taking be a short cut to achieving the goal," he warns. “Everyone’s still climbing Everest in exactly the same way as in the early nineties—in two and a half months,” says Alpenglow Expeditions founder Adrian Ballinger. 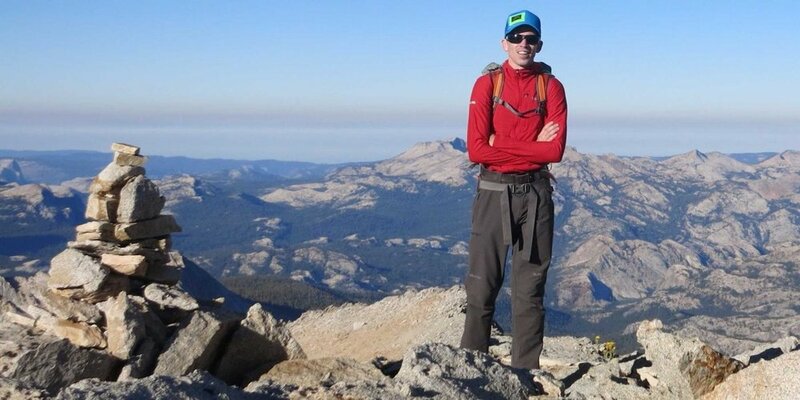 A wiry, British expat who lives in Olympic Valley, California, Ballinger has some big ideas about how best to ascend the world’s tallest mountain. More specifically, he thinks it can be done in half the time that most expeditions take. Starting this spring, the 38-year-old veteran guide will begin screening small groups of experienced clients, charging them top dollar, and requiring them to use hypoxic tents to begin acclimatizing at home, so they can fly by helicopter directly into the 14,180-foot town of Dingboche, a day’s walk from Base Camp. (Climbers more typically spend ten days trekking from the town of Lukla.) There he will outfit them with battery-powered boot heaters and the latest high-flow oxygen masks. The idea is to make it from the U.S. to the top of the world and back in just 40 days, paying $89,000 each, roughly twice the average cost of a guided Everest summit. Last year, in a trial run, Ballinger successfully led his first client in that ambitious time frame. Mountaineers Adrian Ballinger and Emily Harrington have scaled many of the most renowned - and feared - mountains on Earth. In exploring frigid and unforgiving altitudes that most humans visit only in the comfort of a pressurized jet cabin, one piece of equipment has become essential to them: their iPad. It was the fourth day of the final, five-day push to summit Mount Everest, two seasons ago. Conditions were perfect. “We were above 24,000 feet. It was a blue-sky day with only light winds. As a mountain guide, I saw no reason to worry about the weather,” professional mountain climber Adrian Ballinger, founder of Alpenglow Expeditions, recalls. Rather than push on, however, he and his party turned back. Other teams weren’t so fortunate. “There were two or three deaths and a dozen cases of frostbite from teams that stayed,” as well as tents shredded by the winds. Alpenglow Expeditions' Adrian Ballinger on how small business owners can lead their company to success. "When you're talking about skills, teamwork needed in your small groups, that oftentimes correlates to how you succeed and climb, I'm going to be cheesy, the mountain of life. So you have tips for entrepreneurs out there and people looking to succeed in the business world?" "Absolutely, it was something I really noticed, it was these lessons I was learning in the big mountains, being successful with teams climbing Mount Everest, also applied directly to me starting my own company, trying to get it off the ground, and all the struggle that takes. You regularly discuss what the goal is and what the plan is to achieve the goal." One of the most fulfilling moments I get while climbing these days doesn’t happen when I reach the mountain summit. The most exciting moments occur during the ascent. Those times when a client turns to me, faced with some unforeseen challenge--like an outcropping of loose rock, a deep and jagged ice canyon, or the blast of fine mist and pebbly grit from a changing wind--are always when he or she utters the simplest and most important of management questions: Now what? As the leader of a mountain expedition company, our treks up mountains challenge our team members to expand their decision-making and leadership skills. Most of that, especially at high altitudes, involves managing risk. The mountain is a real world training ground where taking the wrong chance can lead to either injury or death--which makes mountaineering an effective, if ultimately unforgiving, teacher. Dreams, in their essence, also include risk. This risk could be physical danger (often true in climbing big mountains like Everest), or it could be financial (leaving a comfortable job and pouring your life savings into a business venture), or it could be emotional (like the feelings of loss and questioning that comes with losing friends and coworkers to climbing accidents). I have experienced each of these forms of risk in my twenty-five-year pursuit of summits and in my creation of an ethical guide service that is changing the way mountains are climbed and guided. I have no doubt that it is these risks, and the willingness to face them, that make my dreams such a powerful force in my life. Weigh risk carefully, and once you decide a risk is manageable and necessary in the pursuit of your dreams, take it. And equally important, support the ones you love when it is their moment to risk. How did you get into ski mountaineering? Adrian Ballinger on the approach, with another of Mother Nature’s giants looming in the background. I’ve been skiing since I was 7 years old, and even when I was a teenager I was kind of trying to do what people today would call backcountry skiing—skiing off peaks in New Hampshire with our skis on our backs and uncomfortable alpine boots. After college I moved to Telluride, Colorado, in 1998, and that’s where I saw the potential of backcountry skiing. I really felt like that was what I needed to be doing: skiing fresh powder and finding my own way. That’s when I started building a lot of my backcountry education and skills. Then I was guiding a lot of international climbing trips in South America and Asia, but I didn’t really bring the two together until 2011, when I ski guided my first 8,000-meter peak. I had skied 20,000 peaks before that, but in 2011 I became the first skier to ski descend Manaslu in the Himalayas. Kathmandu (AFP) - Raise your game, skip the queues and scale the world's highest peak in 42 days: that's British guide Adrian Ballinger's ambitious pitch to climbers preparing to summit Mount Everest. Ballinger's "Rapid Ascent" programme, which at around $79,000 is roughly double the cost of other Everest expeditions, aims to overturn the conventional wisdom that it takes 10 weeks to reach the top of the 8,848-metre (29,029-foot) peak. "The best way to climb Everest is to do it fast -- spend less time hanging around at base camp and avoid the queues as you approach the summit," Ballinger told AFP from his home in Squaw Valley, California. Beyond asking the right questions of race management, racers should approach each race with realism. Ballinger points out that "Two factors - failure to prepare and a killer mentality - can lead to injury." If you're unprepared for the race, or if you go into the race determined to finish, no matter the cost, you're likely to end up injured. They key to training appropriately comes down to variety. Ballinger says, "Don't just train in a gym or around your neighborhood - get inside a climbing gym, or run in mountainous terrain. Check your local area for trainers who have experience in obstacle races, and who can help you prepare for the event." He also adds that event organizers want their race to be successful, which means they want you to be successful. If they send out training or nutrition tips , take them to heart. Ultimately, you must stick to a plan and follow it through until race day. There's no guarantee you'll end up injury-free at the end of the event, but you'll be less likely to experience a preventable injury. Choosing whether to organize a trek through an outfitter or “do-it-yourself” should be a decision made based on your experience and comfort in the mountains. The spectrum ranges from a trip organized with a Western company (who will often provide certified guides, excellent logistics, satellite communication, extensive medical kits, and staff with the knowledge to use them) to a trip organized with a local company (standards of guides, logistics, and emergency preparedness vary) to you trekking solo with your backpack. All can be enjoyable and appropriate ways to experience the Himalaya. Just be sure your choice matches your experience and ability to make decisions when things go wrong. Inexperienced trekkers and tour agencies were equally to blame for many mountain accidents because they lacked the right equipment and did not employ experienced guides, Ballinger said. Every year, thousands of tourists traverse Thorong La, the highest point of a three-week loop around the Annapurna peak, where several people have been killed. It is a wide, barren cleft between some of the world's highest mountains and offers scant shelter.Authorities said they had little idea how many Nepalis were missing from remote villages near the Tibetan border. Unlike tourists, Nepalis do not need to register to enter the mountain areas. A mountaineer hikes the Annapurna region on the Nepal side of the Himalaya. The pass, nearly 18,000 feet (5,486 meters) high—about the same elevation as Base Camp on Mount Everest—is near the site where the bodies of 12 hikers were discovered Wednesday. In the U.S., the only peaks as high as that are in Alaska, said Adrian Ballinger, owner and head guide for Alpenglow Expeditions. "In normal conditions, you can go over that pass and not see any snow or bad weather," Ballinger said. Autumn weather conditions are generally stable, he continued, but "these are mountain conditions, and these storms are not unusual." Inexperienced climbers would be challenged by the difficult conditions that developed during the heavy snowfall that struck the region earlier this week, he said. An accomplished climber, Ballinger's first trip to Nepal, nearly 20 years ago, was to the Annapurna circuit. Back to Everest in 2015? 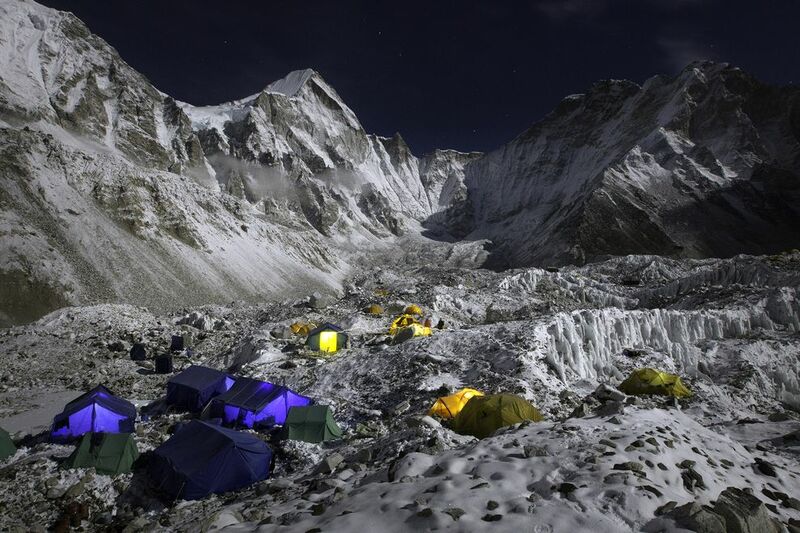 The Everest Base Camp at the Khumbu Glacier is seen at night. The deaths this week of at least 28 people, including eight or more foreign trekkers in snowstorms in central Nepal, have focused the world's attention once more on the potential hazards of mountaineering in the Himalaya. "We need to revisit what it means to climb this mountain," said Conrad Anker, a professional climber for The North Face. Some of that is the responsibility of climbers, he said. "But a lot of it has to do with the outfitters and who they choose to guide and how they choose to do it." Adrian Ballinger, founder of Alpenglow Guides, agreed. "It is a question of whether asking workers to make dozens of trips through the icefall in its current condition is an ethical business practice. I believe the answer is no." Alpenglow Expeditions’s Ballinger says trekkers should their research before choosing a tour provider. The latter—who are part of a lucrative business—could invest more in safety measures while the government could do more to regulate their services, he says. It’s important, however, to distinguish between the two disasters in Nepal this year, Ballinger says. The first involved a group of professionals who were fully aware of the risk they were taking, while the most recent storm took by surprise hundreds of inexperienced trekkers who might not have been as informed. Tour organizer Adrian Ballinger hires private forecasters from Switzerland to provide information about weather in Nepal for his expeditions. He says this option is probably too expensive for novice trekkers, but in this case it did give him 48 hours' warning to bring his climbers to safety. Mr Ballinger says he hopes the disaster will encourage authorities to eventually improve their forecasting systems, but he says in the short term the country's tourism industry will probably suffer.